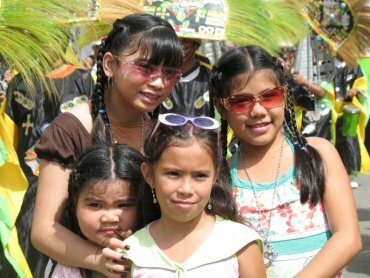 An inherent part of the Filipino spirit is the joy of life and there are few, if any, races on the planet that can match them in their fervor to celebrate their blessings, commemorate their past or observe solemn religious rituals. 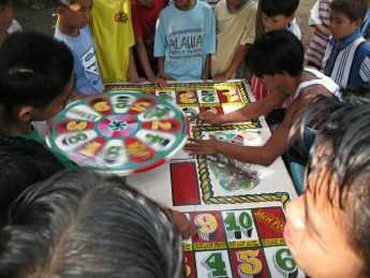 Every town, village, city, province and barangay in the nation has its special Fiesta or Festival Day. Celebrations may take the form of music, dancing, feasting, beauty contests, balls, processions, sports challenges or a host of other events. Spanish influence is evident in the elaborate masks, makeup, headdresses and costumes worn by the revelers; outfits which often take months of preparation. Visitors are always cordially welcomed and invited to share in the festivities. Please find here after all the well known fiestas and festivals in order of the months. Some fiestas are not clearly fixed, please inquire. And there are much more fiestas than those we list here. There are too many Saints for not too celebrate a fiesta tonight. Be warned, when these holidays fall in the middle of the week, then they will be moved by presidential decree either to Monday or Friday, so the Pinoys have a long week-end for celebrations and fiestas. This is unique in the world. January 9 - People from all walks of life go to Quiapo to venerate the miraculous wooden black statue of Christ carried by male devotees during the procession. January 9 - A festival parade in the sea followed by a celebration in Romblon Town. 3rd Week - Cebu City's largest festival, held during the third week of January. It celebrates the Christ Child and features processions and a unique dance step - the Sinulog. The festival is also held at about the same time in Digos, Davao Del Sur and Kabankalan, Negros. 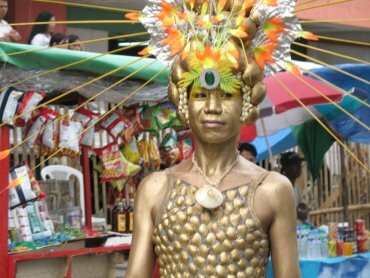 3rd Week - Internationally famous festival, which occurs in Kalibo and other towns on Panay, every third week of January. It commemorates a pact between Indonesian immigrants and native tribes and the Spanish link to catholic religious celebrations. The full name is therefore “Santo Niño Ati-Atihan. 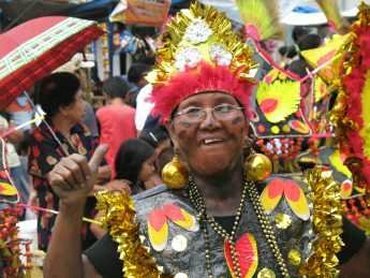 Renowned for the colorful costumes, the blackened faces of the revelers and the sound of drums. 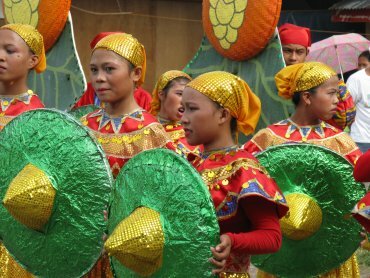 Held in Iloilo, Panay at the same time and for the same reasons as Ati-Atihan, it also features parades, to be less frenetic. Last Sunday in January - A combination of three ethnic festivals, inaugurated in 1988. Caracol is a Spanish term for snail. February 7 - 10 - In Laoag City. Main feature is a Floral Parade. Celebrates the Feast of William, the town's patron saint. February - Musical extravaganzas, trade fairs and pageants featuring show business personalities such as Sharon Cuneta. February 11 - A harvest festival in Iriga, Bicol, which coincides with the feast day of Our Lady of Louraes. Main feature is a parade of colorful and grandiosely decorated bull carabao carts. February - A ten day cultural classical performers and utilizes the spectacular bamboo organ of St. Joseph's Pan. February 26 - A celebration of cultural and religious harmony between Muslim and Christians in this most cosmopolitan of Philippine cities. Marks the date when Zamboanga became a chartered city. 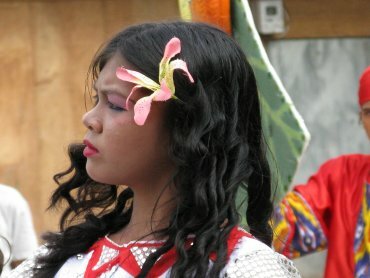 February 26 - 28 - A dance festival in Tumauini ,Isabela, in the far north of the Philippines. Music from the festival is available as MP3 and videos on YouTube. 4th Week - Recently inaugurated to celebrate the vast array of spectacular blooms produced in the mountain capital. Modeled on the Rose Bowl Parade of Pasadena, California. 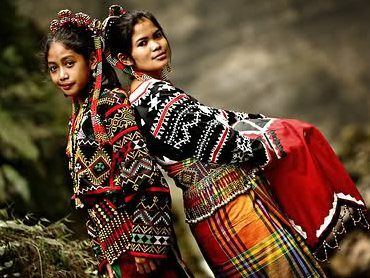 March 3-7 - A gathering of the tribes of Bukidnon province, featuring religious rituals, street dancing and ethnic performances. 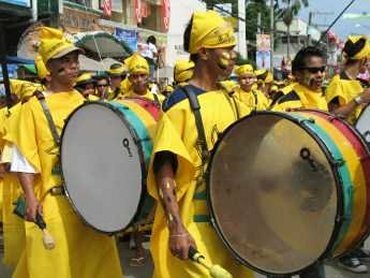 March 7-10 - Celebrates the founding of Abra province with a variety of events, including raft and horse races. March 16 - A re-enactment of the Blood Compact between Spain's Miguel Lopez de Legazpi and Datu Sikatuna, which helped forge friendly relations between the two countries. Held in Tagbilaran, Bohol. March 16-17 - A mountain trek, which marks the anniversary of the tragic death of president Ramon Magsaysay, whose plane crashed on the mountain. April 10-15 - The charter anniversary celebration of Marawi City. A celebration of Muslim culture, including songs, dances, crafts and food. April 27 - A complete re-enactment of the Battle of Mactan in which Magellan was defeated by Lapu-Lapu and his warriors, resulting in the death of the Spanish explorer. 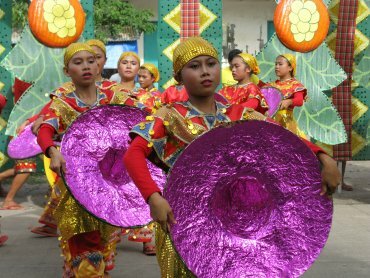 4th Sunday - A celebration of the harvest in San Jose City, featuring colorful costumes and street dancing. Focuses on the contribution of onions and other vegetables to the city's economy. April, May or June - Turumba is a song which requires a unique form of street dancing Held in Pakil Laguna, in honor of Our Lady of Sorrows. 1st Week - Features painting, product exhibits and the calesa parade. Held throughout the month in Alitagtag, Batangas, to honor the Holy Cross. 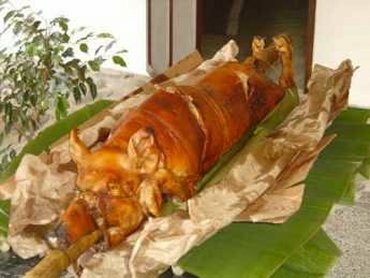 Month long celebrations throughout the province, where sumptuous feasts are prepared. All Boholanos are expected to return home for the fiesta. May 1 - Held in Lingayen, Pangasinan to celebrate the rich harvest of seafood in the province. 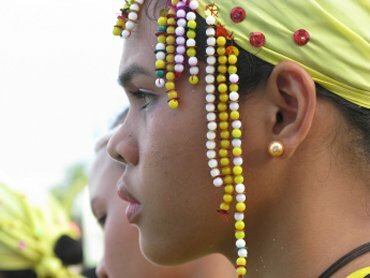 May1 - A fertility festival of pagan origin, held in Nabua, Camarines Sur. May 3 - Held in Pavia, lloilo. The race features the fastest water buffalos in the area pulling bamboo carts. May 6-9 - The highlight of Masbate's Livestock Week, it focuses on the importance of cattle raising to the island's economy. May 15 - Honors San Isidro, the patron saint of farmers. Beautiful decorations, made of edible rice dough, are placed on the exteriors of houses in Lucban, Laguna, representing various agricultural proaucis. 3rd Sunday - A kite flying competition held in Cagayan De Oro City. Held during the last week of May in Tacloban, the festival features sailboat races. Held in Dipolog City, Mindanao, the festival features stationary dancing by native Subanens on three meter structures. June 24 - Celebrates the founding of Manila with parades, sports events and the Manila Film Festival. June 24 - The feast of St. John the Baptist is celebrated in various parts of the nation, including San Juan, Manila; Balayan, Batangas and Camiguin Island. Part of the merry making is water dousing. June 26 - Celebrates the Foundation Day of Batangas City. July 1-2 - Held in Cagayan. A major religious event highlighted bv the procession of the Marian. 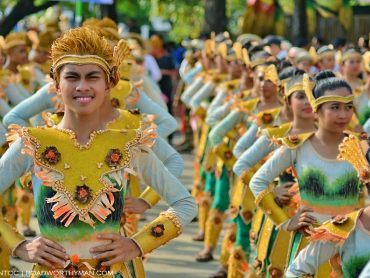 July 3-4 - Held in Tubod, Lanao Del Norte, the festival has its origin in a war dance that connotes masculinity. Unique in the fact that it has no religious connotation. First Sunday of July - The Holy Cross of Wawa is paraded in a specially built pagoda or river boat accompanied by other vessels in a river procession along the Pasig River. July 15 - Cultural activities celebrating the creation of Cordillera Administrative Region. August 2 - Charter Day celebration of Butuan City. August 4-5 - Cultural presentation of the lifestyles of the inhabitants of the Philippines most remote province, Batanes. August 15 - Festivities in Calubian, Leyte, which focus on the various uses of the coconut and its by-products. August 18-21 - The chief Festival of Davao City has a threefold purpose: to honor Mt. Apo, the famous waling-waling orchids and the durian fruits. Month long - The longest running culinary competition in Southeast Asia. September 1-8 - The Filipino passion for cockfighting is celebrated with dancing and costumes which mimic the movements and appearance of the brave birds. Held in Calbayog City, Samar. 3rd Week - Held in Naga, Camarines Sur, the festival features an impressive river parade carrying an image of the Blessed Virgin. 3rd Week - The culture of this unique tribe is celebrated in South Cotabato. 1st week, but movable - A recent inaugurated event, held at Cloud 9 Break near General Luna, which has placed the Philippines on the international surfing calendar. October 6-12 - Held in Legazpi City, the festival depicts Bicol's early history and is named after an early herooftheregion. 2nd Sunday - Celebrates the victory at sea against the Dutch in 1646. An image of the Virgin is paraded through the streets of Quezon City in a carriage decorated to resemble a ship. Also celebrated in Angeles City. October 12 - Features a parade of vinta sails. Held in honor of Zamboanga's patron saint, Our Lady of the Pillar. 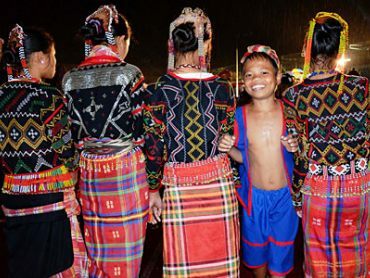 October 19 - The main Festival of Negros, held in Bacolod. Features street dancers wearing masks and colorful costumes. 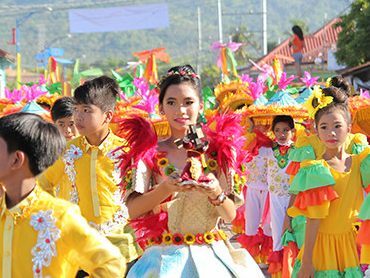 October 22-24 - Held in Virac, the festival celebrates the founding of the province. October 25 - Commemorates the anniversary of the largest naval battle in history, which took place in World War II. Last week of October - Large street festival Balibago, Angeles City. 3rd week - Mambajao, Camiguin, to celebrate the new harvest of this succulent fruit. November 5-13 - Named after a tree with purple-pink flowers, the festival incorporates the celebration of "Cincode Noviembre", a bloodless revolution in Silay, which overthrew the city guards. 2nd Week - Cultural presentations of the T'Boli and Blaan ethnic minorities, held at Lake Sebu South Cotabato. November 11-15 - Re-enactment of the first contact between the natives of Mindoro and Chinese traders. Held at Calapan, Oriental Mindoro. November 22-23 - Held in Angono, Rizal to honor patron saint, St. Clemente. The parade features "papier-maché" giants, dressed in native costumes. December 8 - The main celebrations are held in Roxas City, Panay and Malabon, Manila. The Roxas Festival is a showcase of the culture of the province, while the Malabon celebration features a river procession. December 15-19 - Celebrates the arrival in Mindanao of Shariff Kabunsuan, who brought Islamic culture to the Philippines. Held in Cotabato City. December 19 - A spectacular parade of lighted lanterns in San Fernando, Pampanga.. Lanterns measure between three and five meters. December 30 - The city's festivities include a lantern parade. Come to Camiguin Island! Our Beach Guesthouse is the perfect place to chill out. 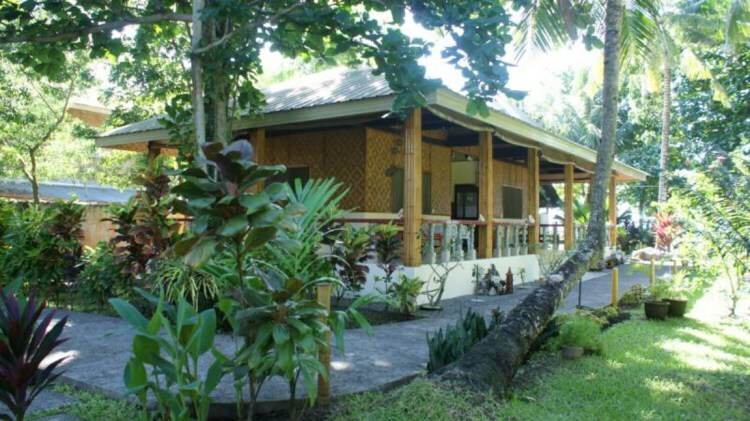 The 2 room house is directly on the sandy beach and lays within a tropical garden. The Black Beach Divers are our neighbours. Brand new equipment and affordable rates. Discover the 3rd dimension. Click on one of the above links. There is much more information and if you can safely book your vacation with us.